THE ANNUAL Hywel Dda programme to encourage people in eligible groups across mid and west Wales to have a vaccination to protect themselves from influenza (flu), a virus that can cause serious illness, has been launched. The superhero based theme is a call to action urging residents to become a ‘superprotector’ by getting vaccinated which will ultimately help protect themselves, patients, their families, colleagues and neighbours from catching flu. The theme will be introduced across Hywel Dda sites using visuals and messaging that have been developed to be eye-catching, memorable and mean something to those that that view the messages with a hope that they are encouraged to make the effort to receive their flu vaccination. Children aged two to ten-years-old are also eligible as the vaccine programme for children is again being extended this year. The vaccine for adults is a small injection, but for children it is a simple nasal spray. Children aged between two and three years can receive the nasal vaccine at their GP surgery while those in reception class and every primary school can get it at school. Ros Jervis, Director of Public Health for Hywel Dda University Health Board, who launched the today, reiterated it is vital that those most at risk take advantage of the free vaccine: “Influenza can be a life-threatening illness for people who are at risk due to their age, an underlying health problem, or because they are pregnant. Sadly, influenza kills people in Wales every year. While most NHS flu vaccines are given in GP surgeries, free vaccination is also available for some eligible adults in many community pharmacies across Wales. Carers, volunteers providing planned emergency first aid, Community First Responders, and, for the first time this year, people working in care homes that have regular client contact are also entitled to the vaccine. Influenza is a respiratory illness caused by a virus that affects the lungs and airways. Symptoms generally come on suddenly, and can include fever, chills, headache, cough, body aches and fatigue. The influenza virus is spread via droplets which are sprayed into the air when an infected person coughs or sneezes. Direct contact with contaminated hands or surfaces can also spread infection. It can spread rapidly, especially in closed communities such as hospitals, residential homes and schools. 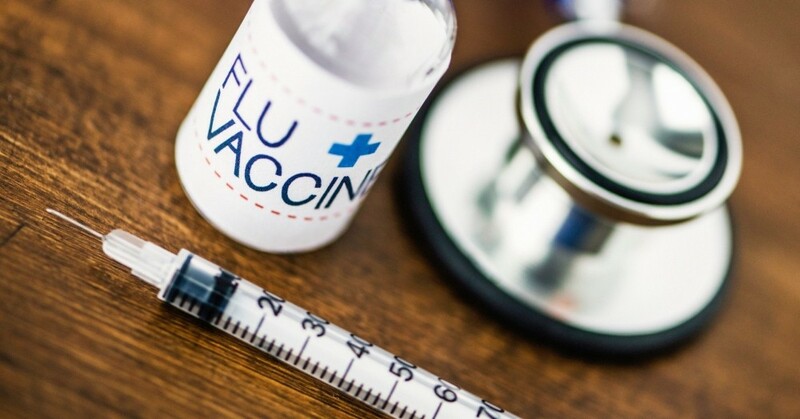 The influenza viruses that circulate and cause illness each winter change and therefore each year the flu vaccine is changed to try and match the circulating strains, in order to give best protection.